I must tell you, Quentin Tod is certainly worth a mention in Swimwatch. So is Greg Meade actually. But he will need to wait for another occasion. Quentin Tod came from the select rural Hawke’s Bay village of Havelock North. Better than that, his home was well up the fashionable slopes of Te Mata Peak. Status and your Te Mata Peak elevation were pretty closely linked in those days. Quentin was different from most swimmers; slightly more serious, more reserved perhaps, certainly better mannered, even at that young age, almost distinguished. During one Hawke’s Bay/Poverty Bay Championship I stayed at his home. I remember it as a comfortable bungalow; a bit like an old jersey, warm, relaxing and secure. In those days the Sunday of the Championship weekend was set aside for the open water race around Napier Harbour. Quentin was a long distance expert. I think he won a New Zealand Open Water championship and also placed first in the prestigious Wanganui Bridge to Bridge swim. In the late 1960s and early 1970s long distance races in Hawke’s Bay were a battle between Quentin Tod and another New Zealand open water champion, Alan Christie. Hawke’s Bay’s finest ruled the New Zealand open water swimming world. Anyway back to my weekend at the Tod home. The family had devised a plan for the Sunday of the Championship weekend. Quentin would swim in the hugely popular cross Lake Taupo event in the morning, and take on Alan Christie in the Napier Port Championship swim in the afternoon. I thought they were quite mad. I did however accept their invitation to go to Taupo to watch Quentin swim across the lake. But, part way to Taupo, I began to put together a plan of my own. 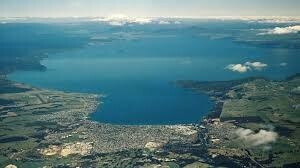 What say I entered the Taupo event and swam across right up close behind Quentin; using his slipstream to aid my progress. Surely I could sprint past him in the final few meters? Perhaps I could win the race. And almost – that’s what happened. I carefully positioned myself behind the speeding Quentin Tod. In no time at all we were well ahead of the pack and, as planned, I was cruising along comfortably in Quentin’s wake. The whole thing was no effort at all; a breeze. This was going to be easy. Best of all the hard working Quentin was blissfully unaware of the free ride he was providing. And then the mistake; the fatal error. I got too close and touched Quentin’s foot. Showing all his open water skills Quentin paused and then kicked as hard as he could. I was aware of his heel sinking into my nose. I felt the blood begin to flow. I saw the water turn red. I knew Quentin was sprinting and I was losing contact. Fifteen minutes later I came ashore in second place to be welcomed by a concerned Quentin Tod. “I’m really sorry” he said, “If I’d known it was you I’d have never kicked as hard”. Of course I didn’t believe him. Perhaps I knew for certain that if some bugger had been trying to steal a free ride from me across Lake Taupo, the least he could expect was a kick in the nose. But, if Quentin happens to be reading this story, I’m still positive I would have out-sprinted the New Zealand Open Water Champion, if only I hadn’t touched his foot. And then I could have bored the national and Florida State champion’s I’ve coached, Toni Jeffs, Jane Copland, Nichola Chellingworth, Rhi Jeffrey, Jessica Marsden, Andrew Meeder and Joe Skuba with the story of how I beat Quentin Tod across Lake Taupo. But I guess second will have to do. “If onlys” don’t seem to count. Anyway we drove back to Hawke’s Bay the proud owners of the first and second place medals. At the time our prizes were most generous. I think Quentin got a TV set and a gold towel with “Champion” printed on one side. I also got something electrical and a red towel with “Second Place” printed on mine. But Quentin’s day was far from done. In the early afternoon he lined up at the start of the Hawke’s Bay/Poverty Bay Open Water Championship; his second five kilometre race in a day. In Taupo he only had me to contend with, but now Alan Christie was in the field. This challenge was made of sterner stuff. But Quentin was prepared. An hour or so later he climbed out of Napier’s harbour in first place; clearly very tired by also well pleased with a good days work. I was hugely impressed. I’m not surprised that his one hour and four minute record swim across the lake stood as the record for the event for forty years. Quentin Tod was a class act – and I’m certain still is. This entry was posted on Friday, April 5th, 2019 at 4:27 pm and is filed under Training . You can follow any responses to this entry through the RSS 2.0 feed. Both comments and pings are currently closed.